"It was the dawn of the third age of mankind, ten years after the Earth-Minbari War. The Babylon Project was a dream given form." 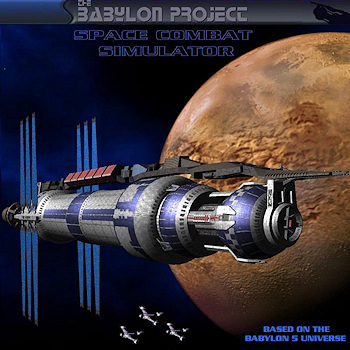 The Babylon Project is styled as a fan-made total conversion mod for the video game FreeSpace 2, although what it is in actual fact is a full standalone freeware game based on the same engine. It is set in The Verse of the television series Babylon 5. A short campaign used as a demo release, set during the Earth-Minbari War. "The Raider Wars", an extended campaign set around the time of the first episode of the TV show's run ("Midnight on the Firing Line") and expanding on that episode's premise. "The Earth-Brakiri War", an extended campaign set in an alternate 2260, where Babylon 5 had been destroyed and the Shadow War never took place. Or did it? A six module training campaign called "Io Training Wing", set in Jovian orbit. "Infestation", a non-linear campaign billed as "Aliens meets Event Horizon meets Babylon 5". Actually going so far as to use snippets of dialog from Aliens and Event Horizon to build their story, and "Event Horizon" is the name the derelict ship found in the first mission. "Drums of War", where you play a Narn pilot in a war with the Centauri. "Dark Children", where you play one of the Shadows. "Survivor", a survival mode with 10 levels of ever-increasing difficulty. "B5 Star Fury Pilot", a series of single missions (available from the Tech Data/Mission Simulator menu) featuring several of the major battles of the TV series. "Fortune Hunters": Play from the POV of one of the Raiders (See "The Raider Wars" above). "The Black Hand": Play as a Psi Cop on a secret mission. A fun training module based on the original FreeSpace training module, featuring a wonderfully bored Deadpan Snarker flight instructor. The mod also has a mod of its own, called "Zathras" (after the quirky caretaker of Epsilon 3 in the TV series), which adds visual and other effects to the game to make it look even more like the TV series. Not to be confused with the Babylon 5 wiki of the same name. Alternate Timeline: The Earth-Brakiri War. Asteroid Thickets: Where the Raider bases are located. Beam Spam: The Brakiri Frigates are serious beam spammers, especially with Zathras turned on. Boarding Pod/High-Speed Hijack: In mission 2 of "The Raider Wars" the Raiders attempt to hijack a freighter convoy this way. The Corps Is Mother: The Black Hand. Colony Drop: In one level of The Earth-Brakiri War, just after getting to an abandoned Space Station, you discover an asteroid on a collision course with the station (in a region of space devoid of asteroids and full of mines), and have to go destroy it. Earth-Shattering Kaboom: One of the endings to The Earth-Brakiri War. Game Mod: Started development as one of these, although by the time it was finished it had evolved well past Total Conversion and become a completely separate game in its own right. Great Escape: In one level of the Earth-Brakiri war, you escape a Brakiri prison, commandeer a Brakiri fighter and try to make it to the nearest jump gate, dodging fire from Brakiri cruisers and fighters. Hero of Another Story: In "The Raider Wars" the Player Character is one to Sinclair et al. You start out leading part of the Babylon 5 fighter wing in the rescue of a transport during the series pilot "Midnight on the Firing Line". You are then transferred to the destroyer EAS Hood for a full-scale campaign against the Raiders. Just Following Orders: The Raiders blow up the EasyLine Starliner Bradbury, then return to attempt to kill any survivors. When demanded to stand down, their reply is that their contract states 'no survivors'. EAS Scylla Captain: This is mass murder! Raider leader: This is business. She does. "Would you be a good boy and activate your self-destruct system for me?" Only in It for the Money: The Raiders begin doing mercenary contract work for an unknown employer. At one point they're told to stand down from massacring civilians, and they reply they would miss out on a big payout if they did. Shout-Out: A PSI Corps pilot hunting a leak in EarthForce makes a snide remark that "Nobody expects the Spanish Inqusition!" Altair Station control doesn't get the reference and your wingman tells him to look it up. Space Friction: Like Freespace and all its other mods, when you cut your engines you will slowly drift to a stop. Space Mines: In three levels of the Earth-Brakiri War, you have to navigate through a minefield. Unlike traditional contact or proximity mines, these mines shoot at you.